Margueritte Bennett says that this is not the new Lobo. 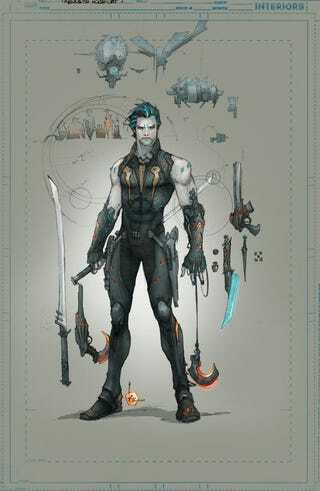 Margueritte Bennett(writer for the new Lobo one shot in September) is saying that this is not the new Lobo. It seems that the art that was presented was the wrong one. I was not in charge of the Lobo redesign. Ben Oliver was not in charge of the Lobo redesign. I wrote my script, and after it was completed, I was shown what the new character would look like. For the record, the images you’ve seen—Ken Rocafort’s design and Aaron Kuder’s cover—are not what Lobo actually looks like in the book. I respectfully disagree with the decision to release that image. When you go to get your comics on Wednesday, Sept 11, before you buy it (if you buy it), pick up Lobo and read the first four pages. You can hate me by Page Two. But if I do not have your attention by Page Four, you don’t have to read something of mine ever again. " So DC's marketting strikes again with another fudge up....Yay.